We offer to teach your pet while they are in our care. They will receive one on one time with a trainer several times a day to learn something new. Since most pets love to learn, their vacation here is even better and you will enjoy a more educated pet when you return. TRAIN & STAY-Would you like us to work with your dog on a command (sit, stay, off, look/focus, leave it, heel, down, come, easy, or drop it) while he/she is here? We will work with them multiple times each day during their stay. Please inquire about rates and availability. BEGINNING OBEDIENCE (Board & Train) –This program is for dogs over 9 months of age that need to learn some basic manners and whose owners need a little help getting their dogs under control. Dogs stay with us for 2-3 weeks and are trained multiple times each day working within their attention span. 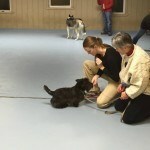 The goal in this program is to get dogs started and under control and teach owners proper training techniques. We are not going to have a fully trained dog in this short time. Owners come to the kennel and work with the trainer and their own dog once each week during the in-kennel training phase to see the progress and learn how to continue the training when the dogs come home. Please inquire about rates and availability.